Back Bay Pest & Mosquito has several convenient pest control options including monthly, bi-monthly, and quarterly services. Regardless of your pest we are here to solve your problem or we will be back out to retreat between regular services at no charge. Ants, spiders, roaches, fleas, ticks, crickets, beetles, silverfish, bees, wasps, mice, rats, and many more pests. Whats bugging you? Give us a call or message us for a free evaluation or simply to asks some questions. We also specialize in convenient perimeter yard treatments for mosquitos. Mosquitos are continuing to grow in population in the Hampton roads area, literally chasing people inside with fear of things like the zika virus. Don’t be a prisoner in your own home give us a call to enjoy your backyard again! Termites are one of the most dangerous and feared insects to a homeowner causing millions upon millions of dollars of damage each year. With all that damage comes stress and big headaches for homeowners. 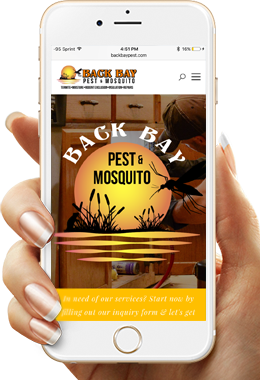 Back Bay Pest and Mosquito is here to ease the stress and give you the piece of mind that you are protected. With our termite liquid barrier treatment by a liscensed technician we will keep the termites out for good! Give us a call or message us for a free inspection of your home. OH Rats!! !Rats are wreaking havoc in Hampton Roads literally destroying attics and crawlspaces and even getting brave enough to invade homeowners living spaces. Although baiting and trapping with our convenient pest control plan is a great place to start we also offer a permanent solution. Back Bay Pest & Mosquito offers a professional rodent seal up service which includes custom bending metal to close off gaps on the roofline. We also seal any holes on the roofline or around the foundation at ground level. We have gathered a great deal of knowledge over 17 years of exactly how and where these rodents like roof rats enter the structure and how to keep them out for good! Don’t be fooled rats can be quiet invaders literally living in and littering your attic and crawlspace with feces and urine for years without the homeowners knowledge. We firmly believe there are two types of house in Hampton Roads, ones with rodents and ones that will eventually get them. Give us a call today to schedule a free rodent inspection! Another nightmare lurking beneath your home could be a moisture condition. Moisture in a crawlspace is bad news, rusting out pipes, ruining insulation and ductwork, causing foundation settling, and most notably causing wood destroying fungus to grow and damage the wooden structural components of your home. As goes the crawlspace as goes the house! Don’t let moisture ruin your investment. Call Back Bay Pest & Mosquito for a free evaluation of your crawl with solutions like dehumidifiers, moisture barriers, encapsulation, fungus treatments, and sump pumps. Doesn’t matter if you are trying to keep the heat in or out of your home, attic and crawlspace insulation are year round solutions to save you energy and provide better comfort in your home. Call us today for a free evaluation of your current insulation levels and low cost options to save you more money on your energy bills. We also offer insulation clean up, removal and replacement for damaged insulation due to rodents like roof rats and other unwanted critters. If you are one of the unfortunate victims of termite and moisture damage we are here to help and put your house back together like new. Wether it’s a few studs and baseboards or major structural crawlspace work there is no job we can’t handle. Call for a free evaluation and estimate! It doesn’t matter if your selling, buying, or refinancing we offer quick and convenient termite and moisture inspections and closing letters so you can close quick on your transaction. We aim to be quick and fair to all parties involved to get everyone happily moving on to their next venture. Agents welcome! We are more than a residential pest control company. With many years of direct commercial pest and bedbug service experience Back Bay Pest & Mosquito can now offer customized, competitive and effective services for all commercial businesses like but not limited to hotels, apartments, food handling, industry, distribution, retail, schools, medical, etc. Goodnight! Don’t let the bedbugs bite! EEEEk! Don’t say that too loud! Yes bedbugs are back with a vengeance popping up in all types of homes throughout Hamptons Roads,. Back Bay Pest & mosquito can get rid of these hard to kill bugs quickly and conveniently. If you suspect yourself or someone you know may have them give us a call for a free inspection and an economical solution and get back to sleeping comfortably at night.